Description: Setting out a car with electrical troubles. 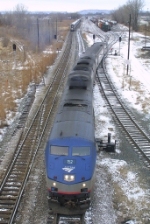 Description: Amtrak 152 leads the westbound Maple Leaf past Lock 19. Description: Amtrak train #303 pulls into Kirkwood Station while passengers and railfans look on - UP Jeff City Sub. Description: Amtrak train #303 pulls into Kirkwood Station - UP Jeff City Sub. Description: 2 trains come together as railfans of all ages look on - UP Jeff City Sub. Description: Either he will end up as a hood ornament or he is heading for a great photo opportunity. Description: Were under a Severe Thunderstorm Watch and a Severe Thunderstorm Warning right now as a storm rips through Poplar Bluff. The train came in at 12:55 A.M. this morning, 7 minutes early with a rare 2 unit consist! He we see those Genesis units and Superliners getting an unscheduled washing stop. Description: Amtrak P42 152 highballs through Westmont with the eastbound California Zephyr. Description: The same unit I got a picture of on the 24th. Description: Only about 3 hours late it will take another hour to turn the train since detouring down the BNSF today because of a hazmat leak in Lake City. CP 5945 CP 889 tied down a day earlier holds the industrial lead. Description: Amtraks Vermonter approaches Palmer to switch tracks. Description: Southbound "Vermonter" shoving through Windsor Locks. Description: auto trains rolls aorund the west a wye in the fading light of the night.